While researching this article, I only just came to realise quite how many classic pieces of literature have been set in the capital city. Spanning a century of literary history, you can explore the ins and outs of London, and discover the great stories that unfolded from writers who either lived in, wrote in, or were inspired by the city's sights and sounds. 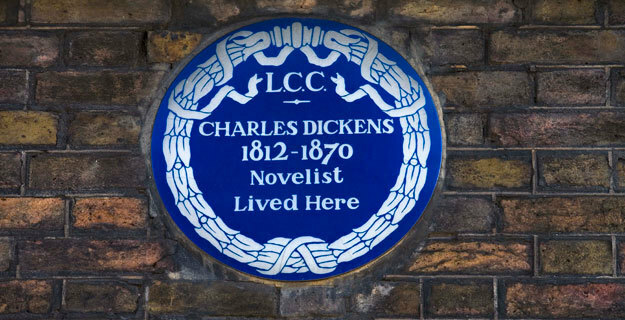 One of the most famous English authors of all time, Charles Dickens was born in Landport, Portsea, but spent his childhood moving between London and Kent. His experiences in life influenced many of his future novels, including The Curiosity Shop and Little Dorrit. The Charles Dickens Museum on Doughty Street is the former home of Dickens, who lived there between 1837-1839. During this time he wrote Oliver Twist and Nicholas Nickleby. It was threatened with demolition in 1923, but saved by the Dickens Fellowship and turned into a museum in 1925. Admission to the museum is £8 for adults and £4 for children; they have recently finished refurbishing the Great Expectations room, and on the 16th November will hold their first costumed tour since its reopening. While there you can see Victorian-style rooms and some of Dickens's personal possessions, including letters, portraits, and manuscripts. J.M. Barrie was a Scottish author born in 1860. He always wanted to be a writer, but his family wanted him to join the ministry. As a compromise, Barrie went to university to study literature. He later moved to London to pursue a writing career, where he met the Llewelyn Davies family. He got to know the five sons of this family very well, and they led to his inspiration for the character of Peter Pan, who made his first appearance in 1902 in an adult novel called The Little White Bird. In the book, it describes Peter's life before his arrival in Never Land, including the story of how he got separated from his mother, and how he came to live in Kensington Gardens. There is a statue of Peter in Kensington Gardens to the west of the Long Water. 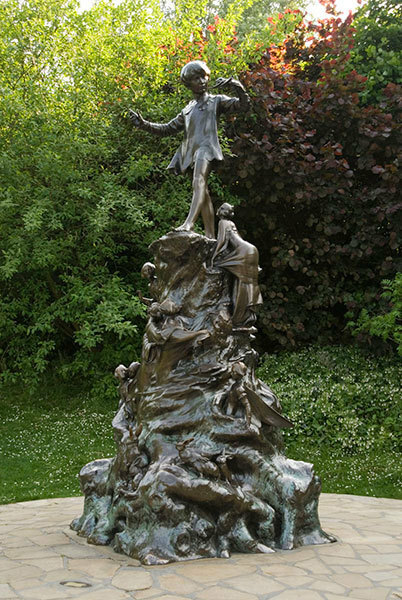 The bronze sculpture depicts faeries and woodland animals coming to greet the young free spirited lad. Berkshire boy, Michael Bond, was born in 1926, and before becoming an author, served in the Royal Airforce during World War Two. He started writing in 1945, but never considered writing for children; it was only after a suggestion by his agent that he wrote his first Paddington story in 1958. The bear from deepest darkest Peru was found by the Brown family on Paddington Station, thus the character's name, Paddington. Bond wrote eleven Paddington novels between 1958 and 1979, and the bear was so popular that he had three television series made after him. The story does not end there, however. Since 2008, Bond has written two further contemporary Paddington books. In honour of the famous marmalade loving bear, Marcus Cornish sculpted a bronze statue of him, which can be found on the concourse of Paddington Station. There is also a small bookshop there, that sells Paddington books and memorabilia. The most recent, and arguably the most famous literary masterpiece set in London is the Harry Potter series by J.K. Rowling. Written between 1997-2007, the majority of the story is actually set in Scotland, but the boy wizard's journey to the magical school of Hogwarts starts out at King's Cross Station. It is at Kings Cross Station that J.K. Rowling's idea for the series was first sparked, and for that reason, she also made it the starting place for her magical creation. To get to Hogwarts School of Witchcraft and Wizardry, Harry Potter must travel on the Hogwarts Express, which departs from Platform 9 3/4. This mysterious platform is hidden to muggles behind a brick wall, through which only magic folk can pass. There is, however, some evidence left behind. If you take a look around King's Cross Station, you might just find a student's trolley halfway through the wall.